The calendar says it’s spring here in the Northeast, but the temperatures in the 20’s are making a liar of it. It’s bound to warm up sometime, so in preparation I’ve decided to get my motorcycle license. I don’t own a motorcycle, but a scooter, which sounds like a kid’s toy. I prefer to call it something a bit more grown-up, like moped or vespa. 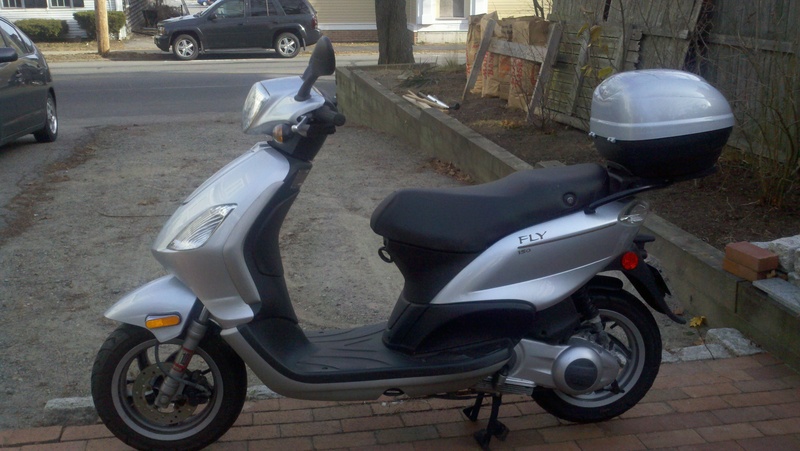 It’s actually a Piaggio Fly 150, and I’m itching to start riding it. For a bunch of reasons I’ve signed up for the Motorcycle Safety Foundation’s riding school. The primary reason is to avoid physical contact with the MASSRMV as much as possible. It always feels like time wasted that I’ll never get back when I have to visit that place. When I finish this class successfully I’ll have my new driver’s license with the motorcycle endorsement sent to me. The 6 hours of classroom training is relatively painless and even made a bit interesting by our instructor, Kurt. 98% on the written test…yay me! On to the riding portion of the course. 10 hours, split into two 5 hour days. Not kidding, it’s snowing and the temperature does not once nudge past 40 degrees. Now, I’ve never attempted to drive a motorcycle on my own before. And they just tell me to pick one of the Nighthawk 250’s that they use for this course and start it up. I honk the horn instead of starting the bike. So 10 riding hours from now I’ll be able to maneuver this thing enough to pass the road test? Yeah, sure. I have to give tons of credit to Diane and Paul, the oh-so-patient instructors who have had to deal with my whining over these 10 hours. I may be one of the most clueless students they’ve ever had. The 10 hours of training pass relatively uneventfully and apparently we’ve learned all the skills we need to not only pass the road test, but drive a motorcycle without killing ourselves. I’ve managed to psych myself out to such an extent that all I can envision is dumping the bike over during the road test. Note to self…think positive thoughts next time something like this comes up. Because what do you think happens during the course of my test? Coming out of one of the figure-8 turns I completely lose control of the bike and careen madly off course. I only wish someone had video-taped this debacle. Wobbling and lurching along for several seconds, speeding up instead of slowing down; I’m sure the bike will tip over any second and I’ll immediately fail the test. And maybe crush one of my legs in the process. Somehow (long legs and lots of Pilates classes save me here, no doubt) I manage to keep the bike upright and rattle to a stop. A glance back at the instructors tells me they’re amazed I’ve kept the bike from going over and they just wave at me to do it over. Get back on the horse, so to speak. Round 2 and I look like I’ve been riding all my life. 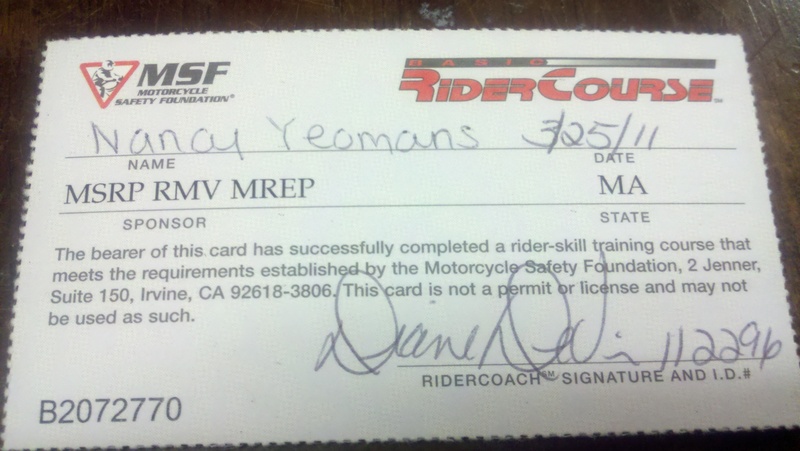 Points off for going out of the lines and putting my foot down the first time, and I’m now a licensed motorcyclist. Hi, oh how I wish I had a scooter! I used to ride motorcycles and had 2 crashes and gave it up (but not endorsement) in 88′. Now unemployed, but hope for close by job and scooter to save $ on fuel! Have fun! Please continue to blog, eh? You’re so right about the fuel prices! Thanks for reading and good luck!